Its been a month since we’d released the last update! An update that brought in some new features and fixes into ConvertPlus. Today, we are back with an update again! 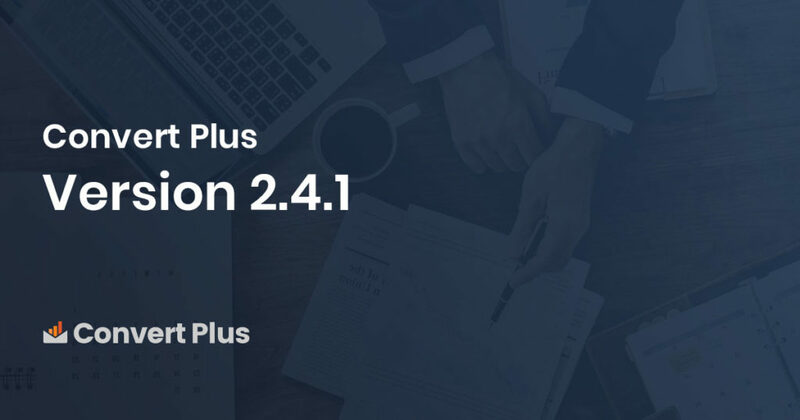 Although we haven’t added anything new or a major change in the plugin, ConvertPlus version 2.4.1 will help you use the toggle button completely (not just the arrow or a specific part on it) and a few fixes that many of you were waiting for. This option lets you minimize a style when the user clicks anywhere on the header or toggle button. Here is a screenshot where you’ll see the option added. – New : Option to minimize style on click of complete header for “optin to widget“. – Fixed : Info bar CSS issue for safari. – Fixed : Conflict due to disabled class with bootstrap CSS. – Fixed : Conflict due to Imagify plug in. – Fixed : Conflict with OptimizePress Experiments plug in. – Fixed : PHP warning notices. – Fixed : Impression count issue for more than one module open at same time. – Fixed : Redirect URL issue if popup is blocked. – Fixed : Special character issue from affiliate link. Another update to show you aren’t left alone! We are sure most these fixes will benefit you all. As always, we present you a new version with a new feature and fixes that will benefit you all. Go ahead and update ConvertPlus. In case of any issues or queries, please feel free to get in touch with us. Our team will be glad to help. You can also post suggestions, queries, feedback and more in our Facebook group where we can help many more ConvertPlus users together.